Jerusalem, once a Jebusite city before David conquered it, is also known by other names, such as Salem, Zion, Ariel, City of The Lord or simply, The Holy City. 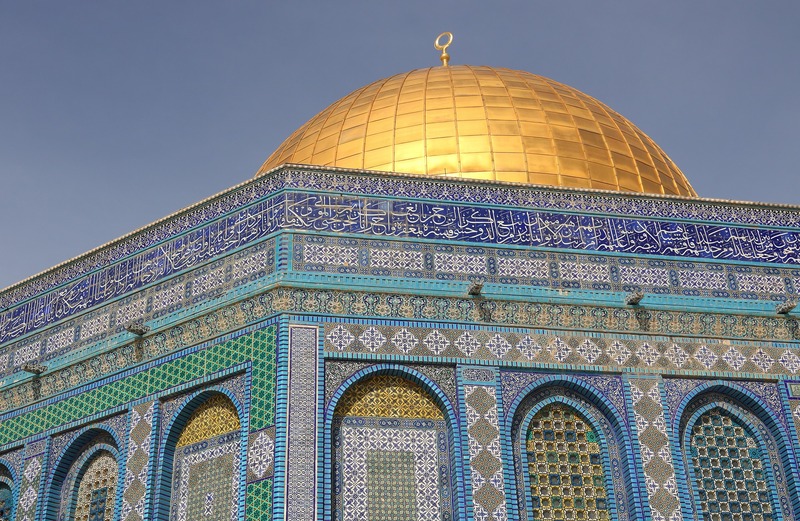 Just the mention of Jerusalem invokes the thought of “looking up” to the `Mountain of the Lord’s house’. (ISAIAH 2:2) Jerusalem can only be reached by coming “up”. Today it is situated on seven hills and has six principal canyons leading up to it. Each canyon ends by a hill or mount that overlooks the city of Jerusalem. Each hill acts as a guardian or fortress for the city. The city is surrounded by a “wall of people”. 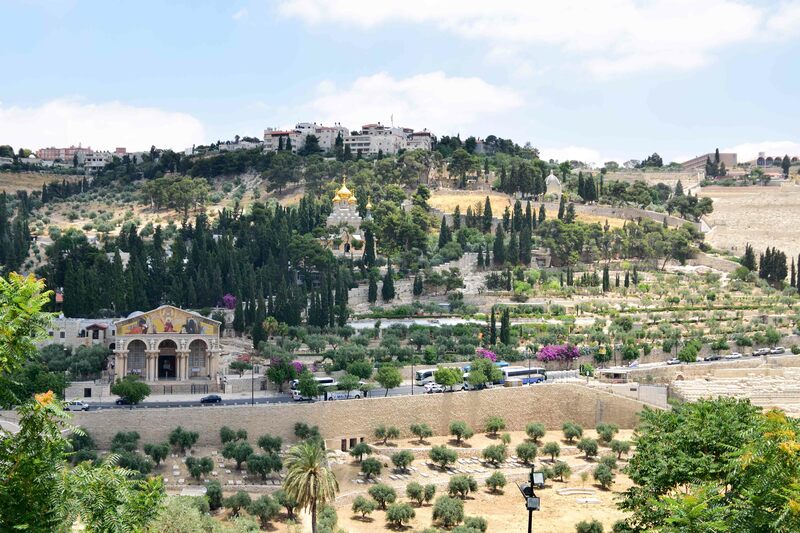 In the Judean hills, the Mount of Olives looks over Jerusalem. It is about 2700 feet above sea level and is the highest of the several hills in the immediate area of the Holy City. This mount is sacred as a place for the dead as well as for its biblically renowned orchards and vineyards. In modern times there is an Ultra-Orthodox group which has dedicated itself to the preservation of graves and protecting the graves as well as those who might pass by from any possible defilement. They put up the warning signs and they are on location of almost all the archaeological digs and construction projects, often creating a hinderance. From Jerusalem the ancient highway goes down to the Dead Sea. In just a dozen miles or so, there is a descent of about four-thousand feet to thirteen-hundred feet below sea level. (LUKE 18:31) The ancient road was rather desolate. It was the commute road travelled by Temple priests who lived in the Levite city of Jericho and served in Jerusalem’s Temple. Since travelling in ancient times included animals for food and barter as well as transportation, and money for accommodations as well, it was not wise to travel alone. Caravans were organized and regularly scheduled. Special travel rules of cleanliness applied to the priests who had to remain “unblemished” to serve in the Holy Temple. They would stay away from any decay or waste matter and of course they kept a distance from anything dead (that was not killed as a sacrifice in the Temple). On the road from Jerusalem to Jericho an old inn has been restored to represent the “Good” Samaritan Inn of a New Testament story Jesus told. This setting reminds us of the parable Jesus chose as he answered a lawyer, who challenged Jesus, the lawgiver; “What must I do to inherit Eternal Life?”. Preceding a consideration of Jesus answer, a little background would be helpful. It is sometimes surprising to consider Jesus as a lawyer instead of a carpenter. Was he sent to earth to be educated as a carpenter? Or is it more likely that Jesus studied the law that he was supposed to restore? After all, he is the lawgiver, our advocate with the Father. “. . . we have an advocate with the Father, Jesus Christ the righteous. . . “ (JOHN 2:1) He was recognized as a Rabbi, a lawyer, one schooled in the Law, he was authorized to read in the synagogues. (LUKE 4:16) So, answering the lawyer who challenged Jesus and having been trained in the law himself, the new Rabbi from Nazareth answered with a question, “What is written in the law? How readest thou?”. Showing his own legal acumen, the lawyer recited the first law of loving God and neighbor, but challenged Jesus to a legal definition, “Who is my neighbor?”. Today, local Jews don’t use the term “Good Samaritan“, to some, it has an anti-semitic inference to bad Jews. Of course, Jesus had no intent of portraying Jews as uncompassionate – in his story he’s making a legal point to the lawyer’s question, legally, who is my neighbor. The Hebrew inference was that the priest, and the Levite were within their legal rights – not to be defiled by being too close to the dead, and rather than take a chance, they went on the other side. Their lack of action was strictly legal, but missed the higher law of compassion – governed by the spirit, not the letter of the law. (Talmudic commentary written some hundreds of years later indicates that Levites or Cohens are required to bury the dead if they chance upon a cadaver). In New Testament times, Jesus was tempted with the wealth of the world by Satan. Jericho is an oasis and as such, an important and busy crossroads. This way station was obviously a place of wealth, natural and man-made. The Mount of Temptation, just above Jericho marks the traditional spot where Jesus’ temptation for wealth may have occurred. (MATTHEW 4:1-11) A monastery has been built into the side of the mount. When Jesus was teaching at Jericho the tax collector, Zacheus, climbed a tree to better see him. Jesus invited himself to Zacheus’ house to dine with him. People murmured that Jesus was socializing with the expropriator of the people’s taxes. It is interesting to note that tax collectors had to reach a quota set by the Romans. It was imperative that taxes were collected above the normal rate when the economy was good so that the quota could be met when the economy was bad. The people murmured that Zacheus may have abused that system for his own benefit. Zacheus became so impressed with Jesus’ teachings that he offered half of his wealth to the poor and four-fold repayment to the people he had wronged. (LUKE 19:1-17) A tree marks the traditional site of that event. These three stories have some connection to wealth. Achan, succumbed to temptation, disobeyed and stole. Jesus, tempted, refused the wealth of the world. and Zacheus, having surrendered to temptation, was willing to repay his wrongs – fourfold. In the same period of history, another community lived close-by, at the Dead Sea, sharing what little wealth they had in a common unity. The ruins of Qumran echo the history of a people supposed by many to be the Essenes, or as they called themselves, the Sons of Light. (LUKE 16:8) The Dead Sea Scrolls were found quite by accident as some Bedouin boys, apparently throwing stones into cavities of rock, out of curiosity examined one of the many holes and caves by the Dead Sea. 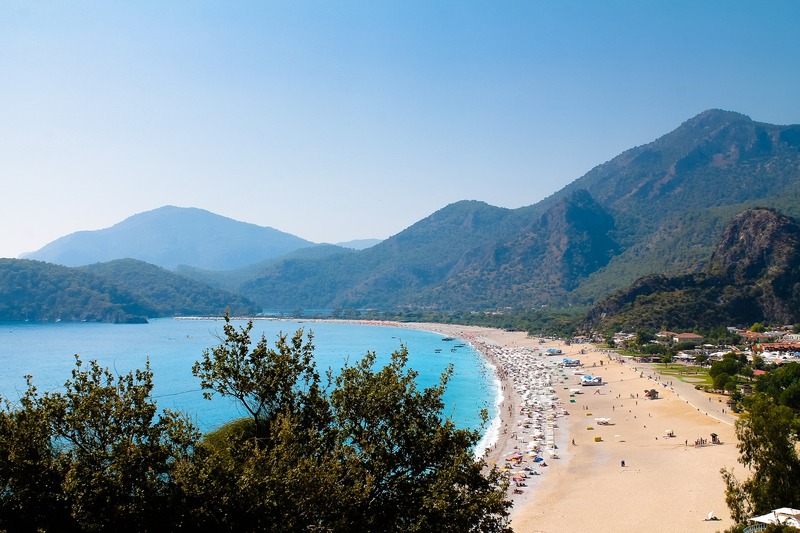 They explored one cave, where their stones had struck a clay jar which had lain hidden for close to two thousand years. The leather scrolls in the clay jars were meaningless to them, but eventually they pawned them off for a “few dollars” to a shoemaker in Bethlehem. He was able to sell them for a substantial sum to a Jewish scholar, Dr. Eliezar Sukenik, who recognized their immense historical value. After the scrolls were discovered, the ruins became significant and were excavated. Living quarters, writing halls, cisterns and immersion fonts indicated a religious Jewish life. It is not strange to find immersion fonts in this community, after all, Jews still practice immersions today. Many religious Jews feel that water used in ritual immersions must be spring water, the term for that is “living waters”. The Essenes kept copies of the scriptures, interpretations of the scriptures and their own scrolls of doctrines and covenants. A part of every book of the Old Testament, except the Book of Esther, was found in these writings, including the entire book of Isaiah. These biblical writings are a thousand years older than any previously known Hebrew biblical text. The best preserved parts of these scrolls are displayed at the Israel Museum in Jerusalem at the Shrine of the Book. 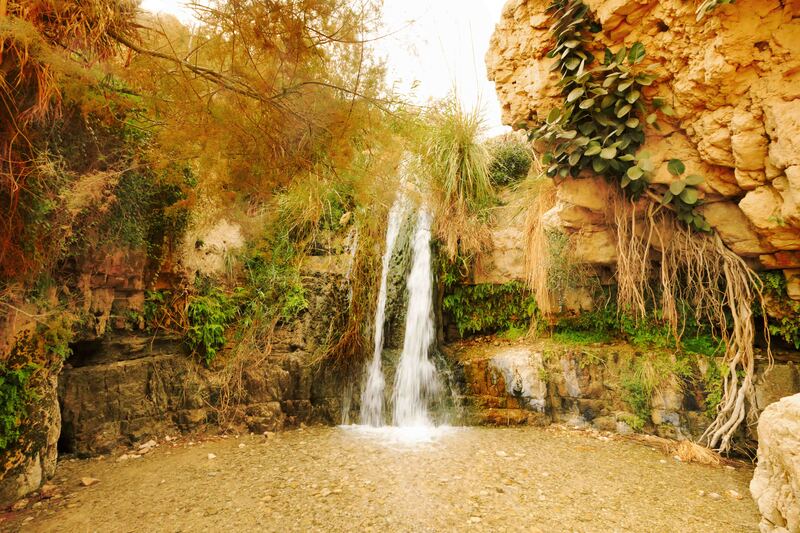 The most outstanding scenic area at the Dead Sea is undoubtedly the oasis of Ein Gedi. (SONG OF SOLOMON 1:14) Cold fresh water, as well as hot sulfur springs, still flow out of the Judean Mountains. The kibbutz Ein Gedi has done some remarkable farming; it has a youth hostel and cafeteria and boasts of naturally hot and cold running water. The natural hot springs and fresh water falls are an attraction enjoyed by many tourists and a constant draw for Israelis who particularly enjoy nature hiking. The kibbutz Ein Gedi operates a successful spa which attracts visitors from all over the world to take advantage of the healing properties of the Dead Sea. The spa as well as other hotels in the area have resident nurses and medical practitioners to assist visitors in their specialized therapies treating arthritic conditions, psoriasis, eczema and other skin difficulties. The mineral content of the Dead Sea is about 27-percent. That is the maximum mineral saturation water can have at this elevation and temperature. A mineral extraction plant is located on its southern shore at Sdom, probably derived from the ancient name Sodom. Minerals and derivatives are exported throughout the world. Minerals included in the unusual body of water are magnesium, bromides, calcium chloride, and sodium chloride. Potash is derived from the Dead Sea. Of course, common table salt originates here as well. 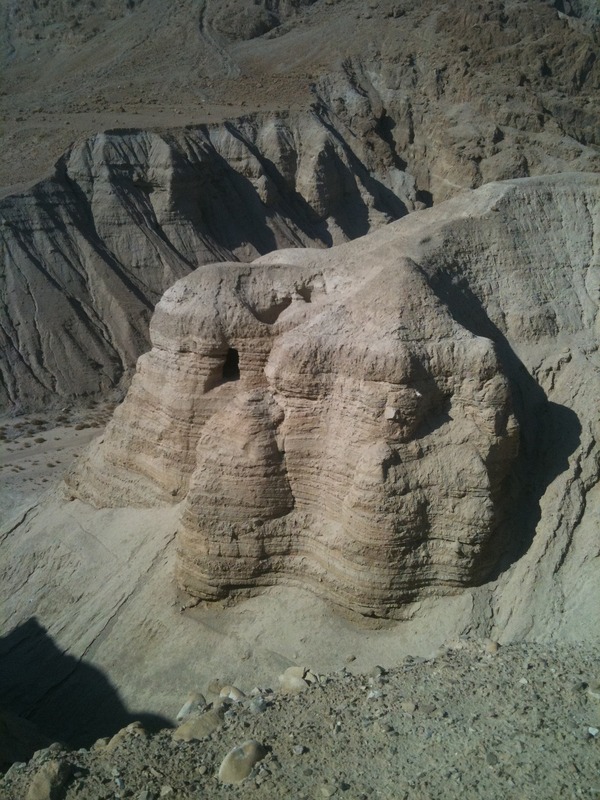 Herod the Great chose the lifeless surroundings of this area to build two palaces on a naturally separated mesa. Built 1500 feet above the Dead Sea, totally isolated and without life support, Masada became an ancient “Palm Springs”. It was also a fortress to protect Herod from his real or imagined enemies. Magnificent buildings, pools, baths and fountains defied nature. There were enormous food storage chambers and many plastered cisterns, carefully surrounded by double walls and lookout towers. After Herod’s death, Roman soldiers continued to use this pleasure palace but later were unexpectedly routed by Jewish zealots who climbed undetected into this remote Roman garrison. Later, in trying to retake the fortress, the Romans tried to besiege the mountain. This was more difficult for the Romans below than for the Jews above who had supplies and stored water. The Romans started to fill in the canyon and build a ramp to the top. Josephus, a Jewish-turned-Roman historian, tells us that the Jews stopped the Romans from building the ramp by throwing boulders down on them. The Romans then brought in Jewish slaves from Jerusalem which had just been destroyed, to keep the Jews at the top from stopping the work on the ramp. In the end, more than nine hundred sixty men, women and children collectively took their own lives, choosing death rather than surrender to the Romans. Excavations made between 1963 and 1967 confirmed many of these strange, almost unbelievable facts, that Josephus wrote about some nineteen hundred years ago. Although an honor and memory of the zealot’s resolve is maintained, the young Israeli, today, has some doubts as to the necessity of their actions. It is said that the underlying reason to take Masada from the Roman garrison was senseless since there was no military or strategic significance for the fortress. It served only the recreation and pleasure of the Roman soldiers. Its conquest did not serve the zealots, nor for that matter, the Romans who subsequently retook it. In that sense, the battle of Masada was a battle of spite. Many young military people, who committedly serve their country today feel that the zealots, 1900 years ago, were misdirected, that the taking of Masada was inconsequential and that zealot lives were lost for an unjustified reason. The memories of Masada faded as the ruins crumbled and were picked over by nomadic Bedouin traversing this desert area during the last two thousand years. In a land of ups and downs, valleys and mountain, even history has it parallel contrasts. The man-made greatness of Massada was brought down, while the humility of truly great prophets in Jerusalem always has us looking up.